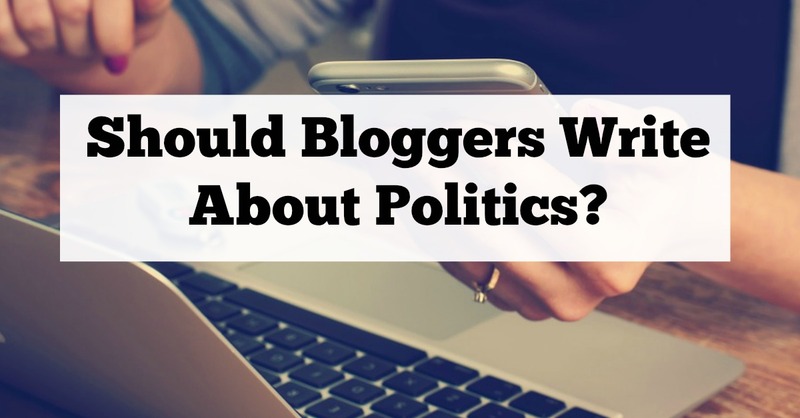 Should Bloggers Write About Politics? Everyone who knows me (and a fair few of my readers) probably know that I'm a left-wing Green Party member. The events that have been going on in the world - Brexit, Trump......they don't sit well with me and they aren't what I personally want for myself or my family. In the last week or so, I have felt a kind of deep sadness and sitting here writing about a meal I've eaten in a restaurant or a place we've visited with the kids has kind of felt trivial and I can't really explain how I feel but I just don't seem to be in the right frame of mind to write my usual blog articles and I feel like I have this huge shadow cast over me. I do want to do more. I want to change the world I live in. I don't like the place my children are growing up in, but what can I do? Should I blog about my Political feelings? 25,000+ people read North East Family Fun every month and I reach over 500,000 people on Twitter - surely if I have a platform, I should use it? I should express my views as that's what blogs are for right? But then it's not my job to try and persuade people to think like me. Who is to say my way is the right way? I am also sure that one blog post isn't going to change the world. Is a family travel blog the place to write about politics? Probably not. One of my good friends has completely opposing Political views to me. She asked my advice recently - should she write about her reasons for opposing the recent women's march? I was outraged, of course she shouldn't - she would experience backlash and it would damage her reputation I said. But now I am thinking - why shouldn't she? Did I say this just to stop her Political agenda as I didn't agree with it? I want to do the same thing and just because my friend doesn't share the same views as me, it doesn't give her less of a right to blog about her cause. We are both equally passionate about our views so if I don't think she should publish a post, what gives me the right to do the same? Then there is the fact that my blog is my full time job. Everyone knows that writing about Politics can be inflammatory and can be frowned upon by some PRs and brands. I rely on my blog work to keep food on the table and a roof over our heads and would be silly to damage this. But then I feel selfish - why does this matter when a lot more people aren't as privileged as me and don't even have a voice? If I can talk for them and help them in any way, shape or form - I should right? There are of course other brands who will welcome bloggers who have their own opinion and are passionate. It's a really tricky thing to get right though. I think all things considered, I'm not going to write about Politics. One blogger can absolutely not change the world and it might actually do more harm than good. Writing about my views and how I think the world should change will probably only work in that it will make me feel better but it won't actually change a thing. My good friend Kelly (from Cygnet Careers - go check her out if you need advice) gave me some excellent advice recently when she said what we need to focus on is being kind to those around us. It's like a ripple effect and will eventually ripple out across the world. So this is what I'm going to do. I'm going to carry on writing about the fun I have with my family and make a conscious effort to be as kind as I can in everyday life. Writing this post has been kind of therapeutic - I know that I can move on now and focus on what I do best - writing about family life and how to make the most of it. Regardless of what is going on in the world around us, it is going to be my job to still bring some sort of joy to our weekends, time off and holidays and that's what I'm going to re-focus my efforts on. I'll leave the Politics of the world to those who actually can make a difference. What do you think? Should bloggers write about Politics? We have the same political leanings and you've just summed up my thoughts on writing at the moment. It's tough when you feel so saddened by world events. I do talk about politics on my media but I wouldn't write a full political party type post as I'm not a political blog. I will make feminist political posts and posts where I talk about inequality and injustice and I feel that's a core value of my blog. It's difficult to know what to do when writing about politics. I, like you, have been very angered about the recent happenings. I don't even think it matters what political party you assign yourself too, we're all human and should respect each other. I think you could potentially write politically without forcing opinions on to people? It's just so hard when you can be so passionate about something not for it to come across like you're forcing it on people. Great post, Sam! A really thought-provoking post. As a BBC journalist, I was trained to look for balance, so while I have my own strongly held opinions, I wouldn't necessarily state them in a non-political area either.